Batman might be turning 75 this year, but he ain’t the only one. Ladies and gentlemen, our other birthday boy – the Joker. 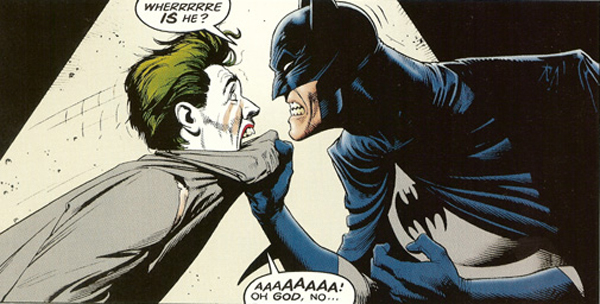 If Bats is the iconic comic book anti-hero, I’d argue the Joker’s the iconic supervillain. Whether Romero, Hamill, Nicholson or Ledger springs to mind when that moniker enters your ear, the Joker’s enduring presence not just in Batman’s ‘verse but in the popular cultural canon speaks volumes to just how effective and remakeable the character is. I mean, where would we be in life without a psychotic, mass-murdering sociopath to remind us how hilarious violence and clown-themed crime can be? So if Year One is how the Batman got his drabcolour dreamcoat, The Killing Joke is the tale of the man who would be Joker. It’s also one of three books – the other two being Watchmen and The Dark Knight Returns – that began the Dark Age of comic books. The Joker escapes Arkham Asylum, kidnaps Commissioner Gordon and shoots his daughter Barbara through the spine, leading Batman on a chase to an abandoned circus ground in Gotham. The showdown between the Dark Knight and the Clown Prince of Crime (which I still find an iffy moniker – I mean, when was he a prince? Is he secretly the heir to Westeros and nobody noticed? Well, they don’t call that fan theory R+L=J for nothing) is interspersed with moments from a man’s life as he deals with a pregnant wife, a dissatisfactory job as an engineer and a burgeoning, if stolid, comedy career that he could fully commit to if he didn’t have all the above to deal with. Who knows, if this guy didn’t have so many issues in his life, he could take up comedy as an occupation, and become a full-time Joker. 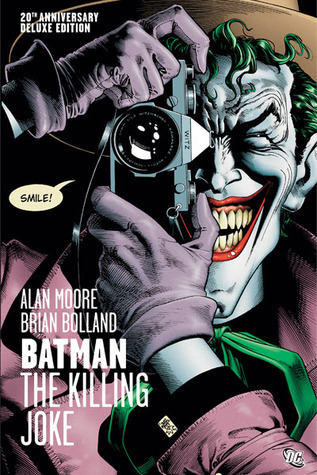 The Killing Joke is written by Alan Moore, beautifully rendered and illustrated by Brian Bolland, and remains the go-to story if you want something Joker-centric. The shorter prestige one-shot format the book uses, instead of a longer arc-based run in the main comic the way Year One was told, means vast tracks of story and subtext need to be conveyed in a brevitous amount of page real estate. It’s the kind of dense, thematically-imbued story that only a master storyteller like Moore, in the days before he swore off superheroes and condemned the lot of us as a bunch of subnormal idiots, could pull off with the page count given to him. I don’t mean to gush so much, honestly. I know there’s no such thing as a perfect novel, and it’s true that even though the one-shot format gives us a tighter, more focused story it still feels like there are areas of the engineer’s backstory that could’ve been fleshed out a bit (despite what Joker might claim about having a multiple-choice past). I know some of the colours during the more nightmarish sequences at the circus can get a little messy, at once aided and hampered by limited-colour palettes whenever Joker decides to get his torturer on. I know a lot of people, despite overall praise, take issue with the ending being so ambiguous. 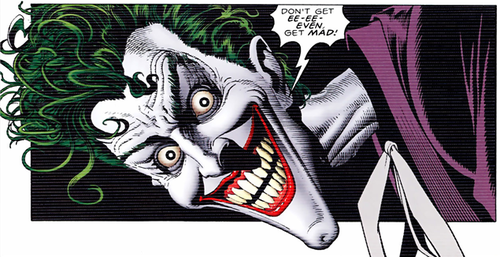 But seriously, I love this not just because it’s a classic but because there is so much you can take from it, and the best part is there’s no real right or wrong way of interpreting the Joker’s most seminal narrative. 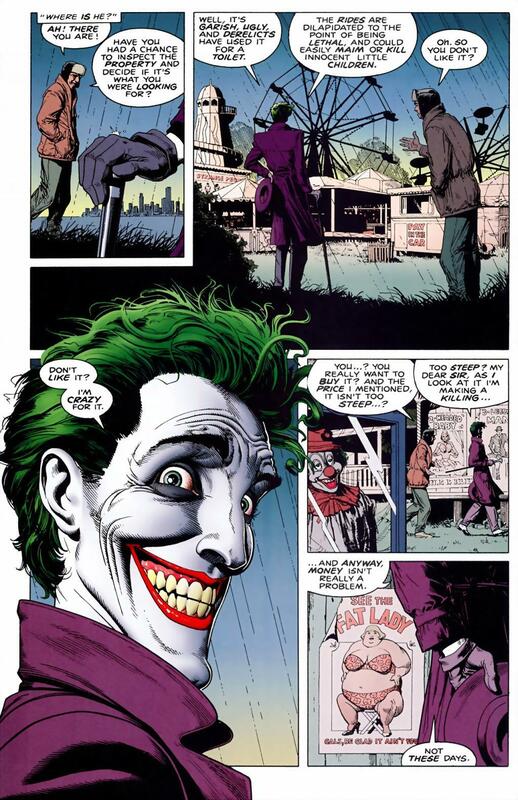 The Killing Joke‘s themes and subtextual elements, not to mention Bolland’s excellent artwork and panel layout that evokes a lot of the hidden structural gems Dave Gibbons utilised for Watchmen, have led to countless theories and interpretations regarding The Killing Joke‘s meaning. 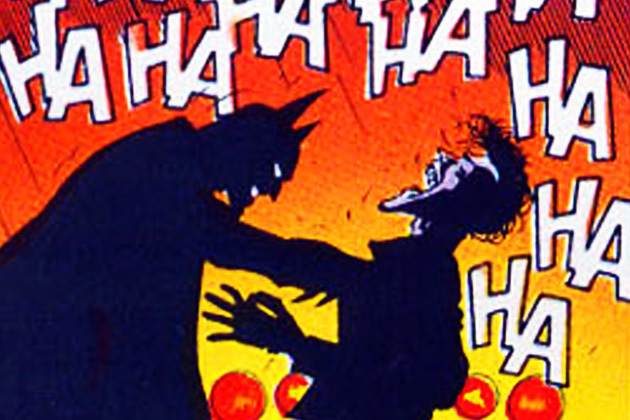 Hell, Grant Morrison even thinks Batman actually killed the Joker at the end of the book, and some other goon took up the latter’s mantle afterwards to go running around terrorising the Bat-clan. It’s that kind of mining for meaning that elevates The Killing Joke above a lot of other Batman, and indeed Joker-centric, stories published over the last few decades. Is it just another day in the life of Batman battling his archnemesis, or does he instead capture the Joker and, after one tragedy too many, reaches the end of his rope to finish the job? Or is so much of this in Batman’s mind, exaggerating psychological traumas in much the same manner Morrison’s own Arkham Asylum did? Hell if I know. I just write and pretend to sound smart. 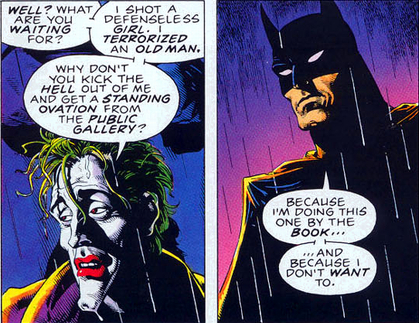 As I mentioned, The Killing Joke is part of a trio of books that kickstarted the Dark Age of superhero comics. The Joker’s always been portrayed as a nutter, usually to the same comedic effect with which Cesar Romero portrayed him in the Adam West Batman! TV series of the 1960s. Moore took this a step further, turning him from being simply Batman’s foil with a circus motif to being a nightmare in clownish getup and an instant reason for coulrophobics to experience insomnia afterwards. The psychotic, horror-fuelled Joker became a staple the same way Batman’s brooding, gritty characterisation began following Tim Burton’s 1989 film and was cemented by Christopher Nolan in the Dark Knight Trilogy. Heath Ledger took that take and the book itself onboard when portraying him in The Dark Knight, and dammit if he didn’t make Moore’s Joker leap off the page with more style and dark panache than almost any other actor could’ve managed. The book also resonates throughout contemporary manifestations of the evilest clown since Pennywise. Scott Snyder kept that dark surge of no-boundaries malevolence around when he wrote Death of the Family, and before him Grant Morrison gave him even more literal monstrosity with all that tongue-bifurcating business in Batman R.I.P. I’d bet good money any Joker write worth their salt will, in some measure, use The Killing Joke as a foundation to characterisation if nothing else. 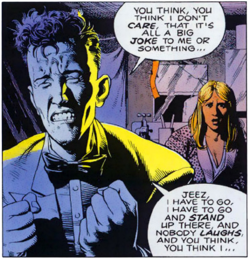 If you’ve ever read, watched, heard or played a Joker story and loved it to pieces, chances are it might owe just a little bit of its genetic makeup to The Killing Joke.